Images taken 7 October 2011 by Terry Blackwood. 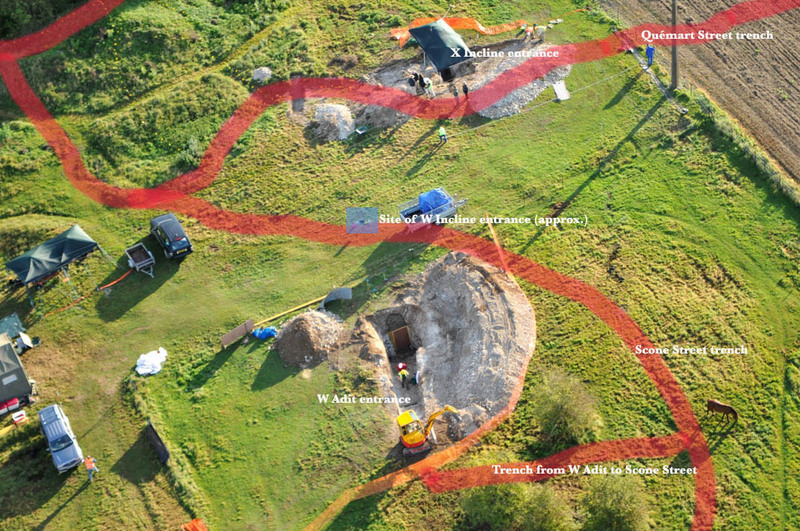 All images are copyright La Boisselle Study Group and cannot be reproduced without their permission. Aerial oblique looking from Lochnagar Crater towards La Boisselle. The boundary of the Glory Hole site is marked. Detailed view of the British section of Glory Hole. 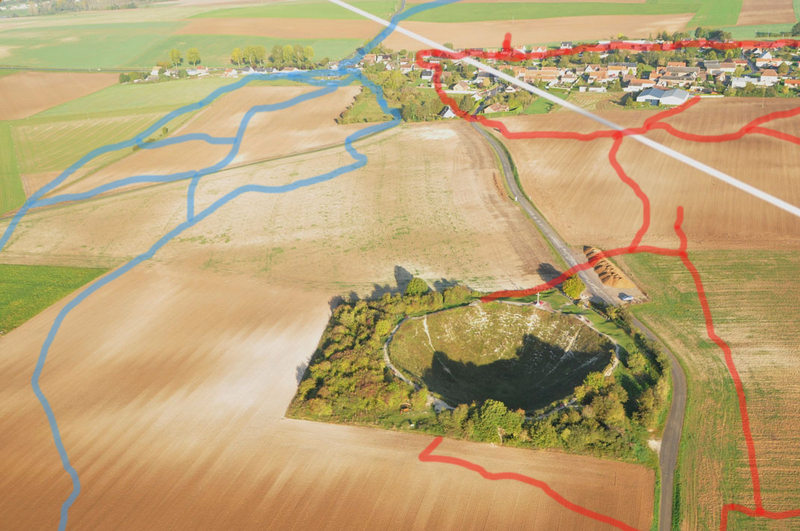 British/French trenches in yellow, German trenches marked in red. Close up view of British-French trenches showing openings of X Incline and W Adit. My grandfather, Pte H.Jones was a member of 18th Battalion NF(1st Tyneside Pioneers) I have read that they were near Y sap on the 1st July 1916. I visited the craters in 2014 not knowing he had been in the area, but had wondered where he HAD been…. My grandfather`s section were called upon for stretcher bearing duties on the evening of 30th June, so removing them from the next day`s attack. He survived the war with only an injury to the arm being sustained during the conflict. He seldom spoke of his activity in Northern France, but did return with his son, my father, in 1968 to pay their respects. He lived on until 1980 dying at the age of 88years. Wow, amazing website. I’m from Dallas, Texas USA. Have visited Somme/Ancre battlefields extensively. I was researching topography around Lochnagar and Tara Hill today as I am reading (again) the Cecil Lewis book, Sagittarius Rising. In the book he describes flying over Lochnagar Crater on 5 July 1916 in a Parasol, going north at 500 feet, then swinging back around to the south, when the plane suddenly broke a connector rod and destroyed the engine in mid-flight. Lewis, with his fellow airman, searched and found the only reasonably feasible strip of land amongst the ocean of craters, on a hillside, on which he landed the plane (going up the slope). I have surmised that it must be part of Tara Hill that he described as it was within walking distance to a copse in a low lying area being used at the time as an assembly area for a battalion moving up. That copse, I would imagine, could be in the vicinity of Becourt. If anyone has knowledge of this incident or any further information or opinions, I would be very glad to correspond. Thank you for this wonderful web site. I will be leading a group in the area on 2 May 2016 and wondered if it is possible to have access to the Glory Hole please. Dear Steve – many apologies for the delay in our response. I have emailed you some information. My great Uncle, Capt Stewart Alexander White, 2nd Tyneside, was fatally wounded on 1 July 1916 near La Boisselle. Next year is the 100th anniversary of this fatal wounding and is my 70th birtday on the same day. 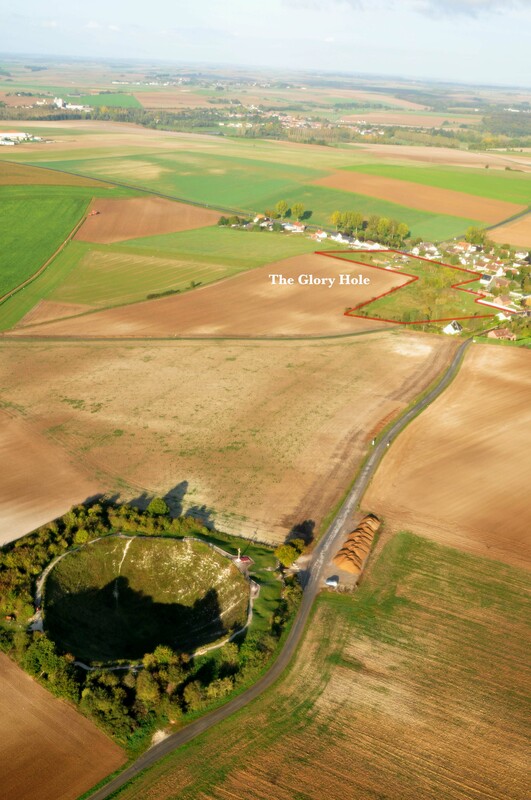 My family are sending me from Australia over to France for this memorable anniversary and I will be at La Boisselle on the morning of the 1st July. My Great Uncle, 1107. Pte John William Camplin (10th Lincolns ) was Killed in Action on 1st July 1916 at La Boiselle. According to notes in the unit diary he died, with his Harold friend Harrold Cammack right by the lip of the then newly blown crater having been incredibly lucky to get across no mans land from the British front line trench. I visited La Boiselle a few years back so I’m very familiar with the lay of the land here. I think what you are doing with your project is totally superb and that it will forever preserve the names of the brave young men such as John Camplin ( aged 21 ) who died here in the name of true freedom. Thank you ……..Alan Thomas. Excellente idée que ces plaques honorant les participants à cette horrible guerre. Bravo!! Ce site est parfaitement valorisé et entretenu. Thank you for the wonderful work you are doing. My step-father-in-law was in the Somme area 1916 ff with Canadian 4th Division, Ammunition Column. From the War Diaries, I think it possible he may have been in the specific area near Albert. He may have loaded the tramways with ammo. I have worked on his history for a number of years, and wonder if I could have permission to use the aerial of La Boiselle by Terry Blackwood to illustrate where these trenches were? Thank you again, Gail Browne. My father was taken prisoner on the Somme just before the August 8,1918 offensive. He was 2nd Lieutenant with a tunneling company just north of the Somme, south of the Bray-Corbie Road & Morlancourt. My son & I visited the area in 2012 but had no idea about the LaBoiselle project. Although the topography is quite different from the area where my Dad was, La Boiselle is a fascinating look at the conditions the men faced. Now I want to return – there is so much to see & understand. Thank you for the work you do & the pictures. Simon you have wonderful website one of Tom Hill’s family would like to thank you for your researching of there Great Grandfather in the first World War 179th Tunnelling Company wish you luck in your new project. My great uncle, Lieut. Oswald Green of the 9th Battalion, Welsh Regiment was killed on the TARA-USNA line at La Boisselle, on the 5th July 1918. I have a copy of the original battalion diary for that day and have been able to pinpoint the spot. He is buried at the Heilly Stn. Cemetery at Mericourt L’Abbe towards Albert. To come upon memorials and cemeteries every few miles is very moving . I have had a good look at the NZ site, and discovered that My Grandad went with the 6th reinforcements, so quite late in the piece I presume. He lived to a ripe old age, and was a coalminer until his retirement, funny that. My Grandfather was a New Zealand tunneler in France. His name was Cyril Durham. Is it possible that New Zealand Tunnelers were involved in the Glory hole and its surrounds? Thanks for your comment Bob. The NZTC was not involved in work at La Boisselle which was undertaken solely by two British Tunnelling Companies – 179 & 185. Please take a look at the website http://www.nztunnellers.com/ which provides extensive information about their work. My family (Neil and Joshua) and myself are just back from a Tour of the Battlefields and visited this site courtesy of our excellent “History Teacher” Iain. I really didn’t believe how small the “no mans land divide” was or how extensive the tunnel systems were until now. It’s only looking at the aerial photograph on your site that I realise how big they are within the landscape. Standing on the lip of the craters is another thing. Iain has certainly brought history to life for us. The reading matter has increased ten fold. Hope all goes well with this project. We hope to be back in the near future. Possibly with a bus load of cadets!!! Many thanks Iain. My father, brother and I were touring the Somme and the curators at the WWI museum in Albert recommended we stop by the Glory Hole 😉 site. Mr. Barton and Simon Jones showed us around the site to our delight. I’d seen Mr. Barton’s Ypres excavation on the History Channel and it was special meeting the team. Many thanks to the La Boiselle Project for making a special trip all the more special with the tour, insight, and for providing context to the battlefield. We saw the Grand Mine, but not until Simon showed us the location of the trenches did we understand what was what. Have recently visited the battlefield area of the Somme. We were recommended to visit La Boiselle Project by our hosts Diane & Vic Piuk. We were not disappointed. Despite being very busy continuing the excavation work we were shown around by Peter and Richard. We are from a mining area in South Yorkshire and feel proud to have seen and heard about the contribution tunnellers made to the war effort. Have just got home this evening from visit to the battle fields ( with Leger holidays). we were due to visit the Newfoundland cemetery/museum, but because the Canadian attache was visiting were unable to go in! This turn out to be a bonus for me and my son Tom, as our tour guide Iain is part of the La Boiselle Study Group. He took us to the site and gave the group a personal tour. Iain`s obvious enthusiasm for this project was clear for all to see, I felt privileged to be able to visit the site. Thanks Iain for your great input on our trip. My great uncle (George William Whaley) is buried at the Gordon Dump Cemetery about 300 yards away and he died in the Somme offensive, I’ve visited this area a great deal over the last few years to put flowers on his grave but never knew that the tunnel entrances were this close to his last resting place. I will be visiting his grave again at the end of August and wondered if the tunnels would be open at this time? 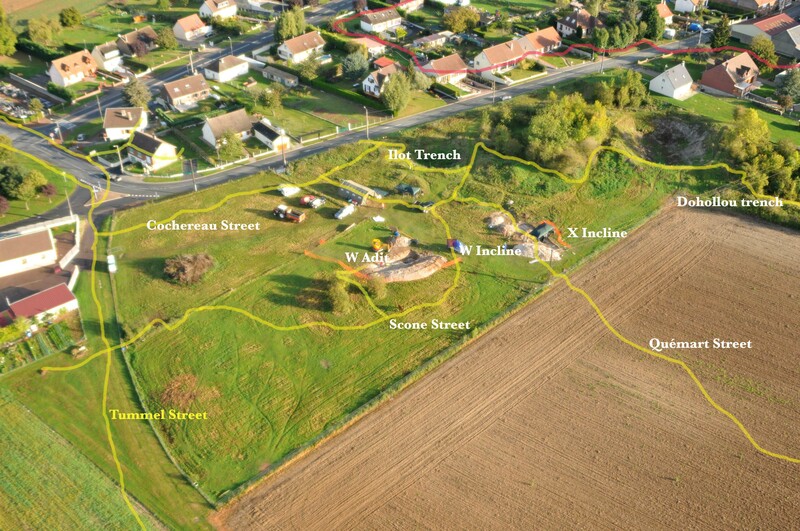 aerial -then and now- photos of Ovillers -La Boisselle taken by Terry Blackwood in october 2011. The villge and the glory crater.Could you send me them? I am working on the memory of the soldiers of the 118 th Rgt (Quimper-Cornwall) who fought with the 19th (Brest)before august 1915 in this bloody sector, just before your great fathers. I was there with my father and two brothers a week ago today (1/11). Richard and Iain were nice enough to take us in and show us around. Truly amazing! St. James Catholic High school, Cheadle Hulme had the privilege to visit the La Boiselle project. A unique experience not to be missed. The pupils could not believe their luck and fully appreciated the experience. We would like to thank Ian and Peter for allowing us the opportunity to visit giving the pupils at St James a truly memorable experience. Good luck with the project and hope to visit again next year. I am visiting the site today with a Group from Bury Grammar School CCF. It is an incredible piece of history and archaeology.